I was trying so hard to stay on my yarn diet. 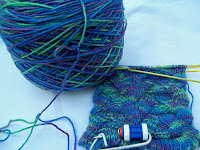 I finished up some projects in "old yarn" and was working on others. Then I succumbed. Bought some more and actually upped the stash again. Just like falling off a real diet. 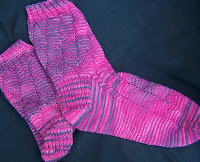 Monkey Socks in Opal Handpainted. Done as per pattern and a little too tight for me. Will probably be a gift for Christmas 2007. FO #23 couple of pics...right picture is closer to original color. Garter lace shawl for Grandma. probably will be gift Christmas 2007. 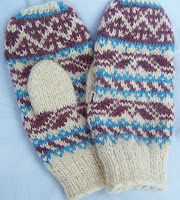 North Iceland Mitts...slight colour modification because I didn't like the wide band with no colour patterning. My size but might gift them. 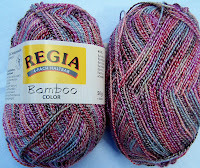 Cherry Tree Hill Sockittome "Java" and Dream in Color Smooshy "Nightwatch"
Regia Bamboo Color 1065 and Shaefer Anne "Blue 2"